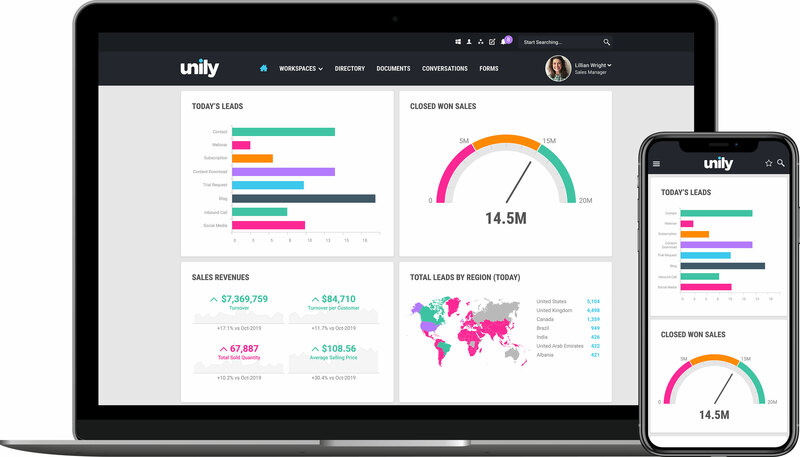 Unily’s Digital Experience cloud enables both IT professionals and developers to build new experiences with minimal overheads. Delivered as a Platform as a Service (PaaS), minimal management and maintenance overheads mean that IT teams are free to support the business in delivering more innovative solutions to end users. Using modern web frameworks like Angular JS and twitter bootstrap, developers can build new features and widgets that surface content and interactions from Unily’s DXC or from 3rd party platforms. With a comprehensive set of API endpoints you are also able to use Unily’s DXC as a decoupled CMS and deliver content to different devices and services. Integrate simply and securely with third-party applications to give users the information they need, delivered in new and engaging ways. Unily’s DXC integrates with Git to provide source control features that developers love. Build solutions in your favorite IDE and push them to your site in seconds. Any OAuth-compatible service can be easily registered with the platform and securely invoked from your widgets. Use these anywhere within the platform to include live data or interactive features that uniquely engage users with your content. Whether you just want to present data or build sophisticated interactions across multiple systems, the only limit is your imagination. Connect your entire digital landscape together and provide an engaging, enriched and united experience with Unily’s Digital Experience Cloud. Applying perfect branding. For every user and every experience. With complete control of the User Interface, you can build experiences that are unique to your business and always on-brand. For simple site themes just select your color palette, upload your logo and you’re done – no coding required. To take full control of the UI, developers can use familiar techniques and frameworks to create perfectly tailored experiences. Customize headers and footers to suit your brand or keep it consistent with a common look and feel. It’s easy to give your site an identity which makes users feel right at home. Once you’ve built your brand, apply it quickly and easily across multiple sites, or target it to specific audiences for that personal touch.